PD-1 Monoclonal Antibody is immunoaffinity chromotography purified IgG. PD-1 Monoclonal Antibody is supplied in PBS containing 0.02% sodium azide. PD-1 monoclonal antibody can be stored at -20 degree C, stable for one year. Small volumes of anti-PDCD1 antibody vial(s) may occasionally become entrapped in the seal of the product vial during shipment and storage. If necessary, briefly centrifuge the vial on a tabletop centrifuge to dislodge any liquid in the container`s cap. Certain products may require to ship with dry ice and additional dry ice fee may apply. PD-1 Monoclonal Antibody: Cell-mediated immune responses are initiated by T lymphocytes that are themselves stimulated by cognate peptides bound to MHC molecules on antig en-presenting cells (APC). T-cell activation is generally self-limited as activated T cells express receptors such as PD-1 (also known as PDCD-1) that mediate inhibitory signals from the APC. PD-1 can bind two different but related ligands, PDL-1 and PDL-2. Upon binding to either of these ligands, signals generated by PD-1 inhibit the activation of the immune response in the absence of "danger signals" such as LPS or other molecules associated with bacteria or other pathogens. Evidence for this is seen in PD1-null mice who exhibit hyperactivated immune systems and autoimmune diseases. Despite its predicted molecular weight, PD-1 often migrates at higher molecular weight in SDS-PAGE. 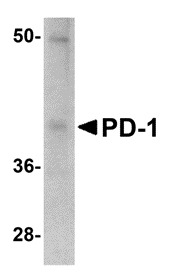 PD-1 antibody can be used for detection of PD-1 by Western blot at 1 ug/mL. Antibody can also be used for immunohistochemistry starting at 2.5 mug/mL. Optimal dilutions for each application to be determined by the researcher. Positive Control: MBS153298-PD-1 Recombinant Protein. Western blot analysis of PD-1 in A-20 cell lysate with PD-1 antibody at 1 μg/mL. 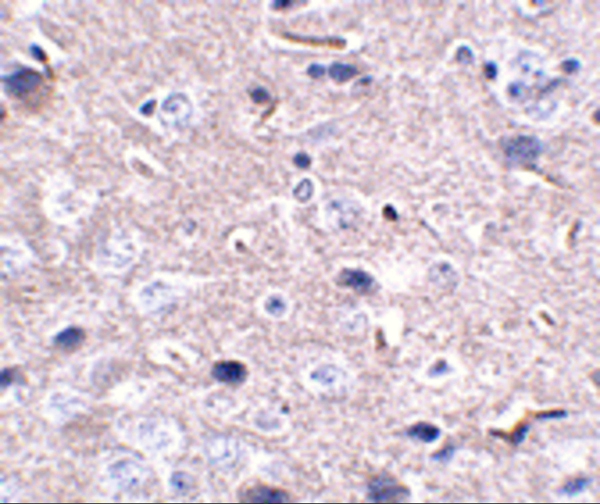 Immunohistochemistry of PD-1 in mouse brain tissue with PD-1 antibody at 2.5 μg/mL. NCBI/Uniprot data below describe general gene information for PDCD1. It may not necessarily be applicable to this product. PDCD1: a single-pass type I membrane protein. A negative regulator of activated T cells, is upregulated in human and mouse 'exhausted' T cells during persistent viral infection. A marker of angioimmunoblastic T-cell lymphoma and germinal center associated T cells.